ViewSonic VFM1024W-11 is a 10-Inch Digital Media Frame features 128mb internal memory, 10″ (25.4 cm) color TFT active matrix LCD, 1024×600 high-resolution picture display, Digital Photo Frame, power adapter, remote control, USB cable, Quick Start Guide, User Guide, and Internal stereo speakers. 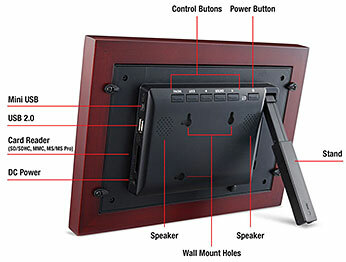 This digital photo frame also supports SD/SDHC, MMC, MS/MS Pro, and USB Thumb Drives; Plays MPEG1, MPEG4, Motion JPEG, JPEG, and MP3 media files. The Digital Media Frame measures (W x H x D) 12.5″ x 8.5″ x 1.6″ (306mm x 215mm x 40.5mm) and weighs 3.2 lb. (1.45 kg). Delight your loved ones with ViewSonic’s VFM1024w-11 digital photo frame. With its 1024×600 ultra high resolution screen, display your photos in beautiful color and vivid detail. Not only does the VFM1024w-11 function as a digital photo frame, it can also be used as a digital media album featuring superb video and audio play back quality. Onboard scaling and ArcSoft® features enhance the total viewing experience. An intuitive menu control makes the ViewSonic VFM1024w-11 easy to enjoy, customize your photo albums and share your favorite photos and videos. As a gift, the VFM1024w-11 is the picture perfect way to show your loved ones how much you care. 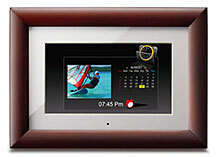 Preserve memories and relive them anytime with the VFM1024w-11 digital photo frame. With an incredible 1024×600 resolution the VFM1024w-11 screen displays photos in super fine detail. Its high contrast ratio and brightness will dazzle you with brilliant color picture performance. Use the display image sizing feature to optimize your images for full screen viewing. The LCD color adjustment supports brightness, contrast, color and tint adjustments to create the perfect picture setting. The intuitive menu system with advanced features allows you to customize your photo album with a slideshow shuffle effect, transit effect, selectable slideshow speeds and more. Customize even further with built-in ArcSoft features such as dynamic lighting, faces beautiful and face tracking and many more.. The magic screen feature enables a four-split screen display with random image rotation. The VFM1024w-11 showcases and highlights your long lasting memories with entertaining and fun effects. The VFM1024w features excellent video and audio play back. Video playback performance is smooth and flawless for showing all your most memorable video collections. 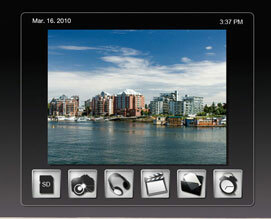 It supports MPEG1/4 and Motion-JPEG video formats. It is easy to add your own personal favorite soundtrack to bring your slideshows to life. The handy remote control allows you to adjust volume, change songs and also photos. Sharing your photos never sounded so good. Instant photo slideshows are at your fingertips. Just insert a memory card into the memory slot and your slideshows begin running automatically. The VFM1024w-11 supports SD/MS/MMS memory cards. Your photos can also be displayed straight from your digital camera to your photo frame instantly. Want to store images directly onto the photo frame? No problem, it also has a built-in 128MB of internal memory. Supports JPEG image format. The elegant cherry wood frame blends nicely with any home decor or at the office. The sleek finish provides a unique look to complement the great images you have on display. The VFM1024w-11 offers picture auto rotation to display your photos vertically or horizontally. The auto on & off feature also helps conserve energy when the frame is not in use. The calendar, alarm and clock features adds practical functionality to the VFM1024w. Enjoy your favorite photos and stay on schedule too! This entry was posted on Tuesday, February 5th, 2013 at 12:22 pm and is filed under Digital Frames. You can follow any responses to this entry through the RSS 2.0 feed. You can skip to the end and leave a response. Pinging is currently not allowed. maybe 30 years in the software industry has made me dumb or I am an alien! this product has the weirdest logic for sequencing the photos. I plugged in an 8 GB usb stick with several folders and it is showing the photos by picking them one each from each of the folders! and I have not been able to find an option for making it show just one folder or folder by folder! sorting by date or name does not change the logic.